The Northern Co-Hort team is heading to Chetwynd Thursday February 21, 2019 to connect with ranchers, farmers, greenhouse operators, land owners and anyone interested in food production! We have been working hard over the past few months to bring our regional producers together to connect and to listen to what support our producers are identifying they need. 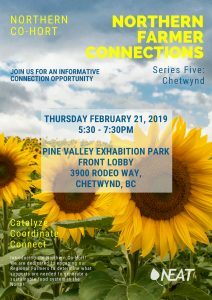 Looking forward to connecting with our regional producers in the Chetwynd, if you are a producer and would like to schedule an interview please contact bess@neat.ca to book a time with us today!